Well i missed my early alarm as well, but driving through Boronia on the way to work (using back roads) Even after the SES has obviously been through there, you can see how much the winds have effected the area. Underwood road was pretty messy, and work colleges in the area reported some sizable branches flying around the place last night. Sadly didn't have time to stop and take photos. Hope those in Boronia and surrounds only received property damage and no injuries!! As for peak winds, Hogan Island peaked at 156kmh whilst the Prom clocked in at 135kmh. As for today, winds to 40kts as this next front in much further south and wont pass thru Bass Strait. This one is going to smack Tassie hard!! Yeah we may of seen the worst of the winds for now they will pick up gradually through this afternoon but ease again slightly this evening the worse of it was yesterday todays front is further South but the westerlies are very tight in and around that front so good luck to the islands on Bass Straight & Tassie. 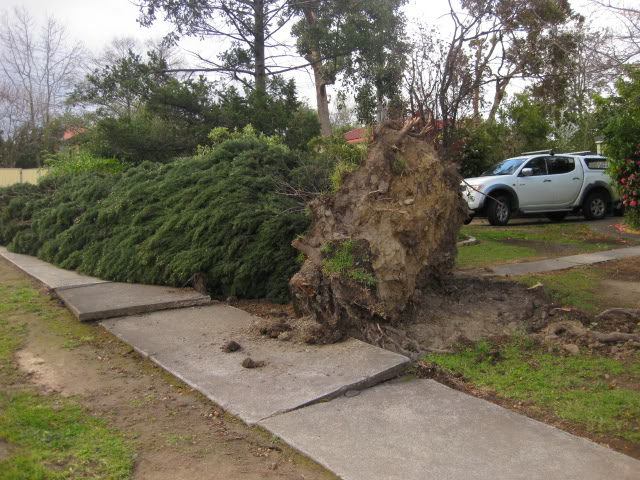 Going by the pics seems like alot of damage was done we were warned by the BOM and SES & Media, sometimes they go over the top but must say the warnings warrented the outcome this time just hope no one has been hurt. Hi all,first post. Long time reader of the 'other' forum,love reading everyone's analysis. I know nothing about the specifics of weather,but enjoy the statistics and radars and what not. Lived in the NT for 4 years and loved watching the radar and storms up there. P.S- Thanks for the Pm John,I tried to reply but it said your mail box was full. Winds to around 40 knots here. Mount Evelyn is pretty bad. WOW!!! Those winds would have been near 130kmh!!! Nice work Jonesy - welcome!! And Mt Evelyn in parts is sheltered!!!! Well, i was stuck in the dallas brooks hall most of yesterday on set as they were filming....so i missed all the events of yesterday...althought it was so windy at one point the catering tent was just about being lifted off the ground and peoples dinners flying away! Karl Lijnders wrote: WOW!!! Those winds would have been near 130kmh!!! I'm dissapointed I missed the gust,would of been great to witness . The suburbia background noise now is chainsaws...very post cyclone feel to it. Gusts to 50 knots down in Geelong presently. Winds starting to really pick up now at times, rattling the windows and roaring along the rooftop. Winds are pretty strong in parts currently - particularly down along the Bellarine Peninsula. 40-55kt winds widespread there. at your pics, Piggy! From what you were saying earlier today though, it's in very specific areas along Birmingham Rd and up at the roundabout, not a generalised, widespread area of damage in Mt Evelyn? Glad you and the family are safe and ok, I was worried about you for a while there (until I remembered to check my mobile ). 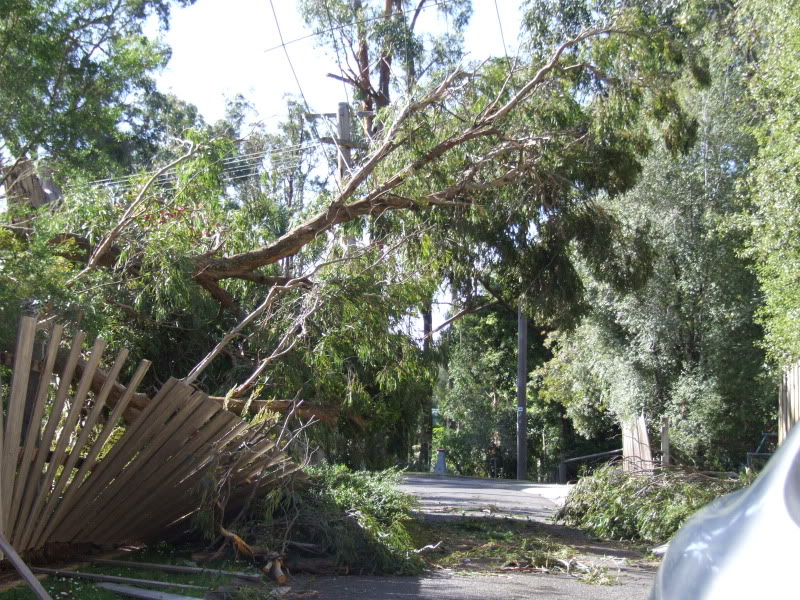 I had appointments up around Montmorency area today, quite alot of debris around and all over the road (twigs/leaves/smaller branches) and evidence of a few trees down to the sides of the road. One client I saw was telling me he arrived home last night to find his neighbour's entire pergola roof sitting on his driveway! 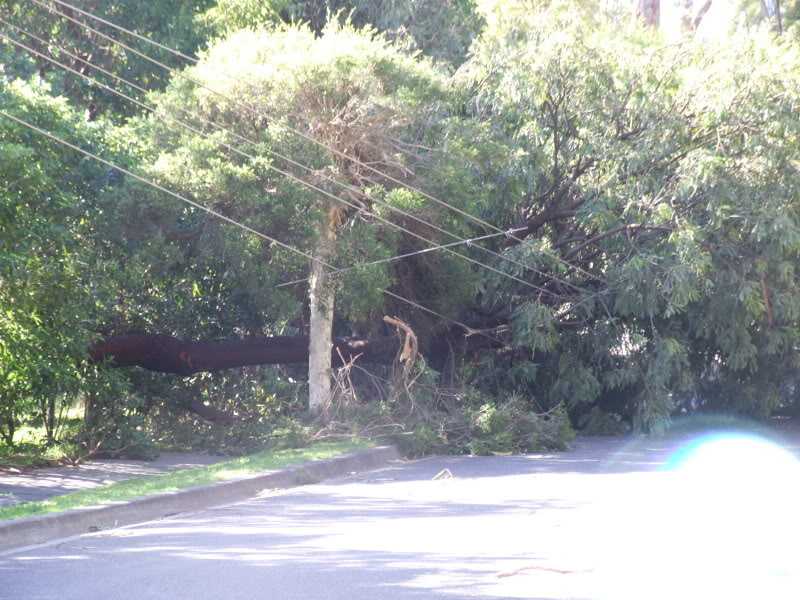 Just in Boronia surveying the damage and there is still a fair bit of tree damage around.. 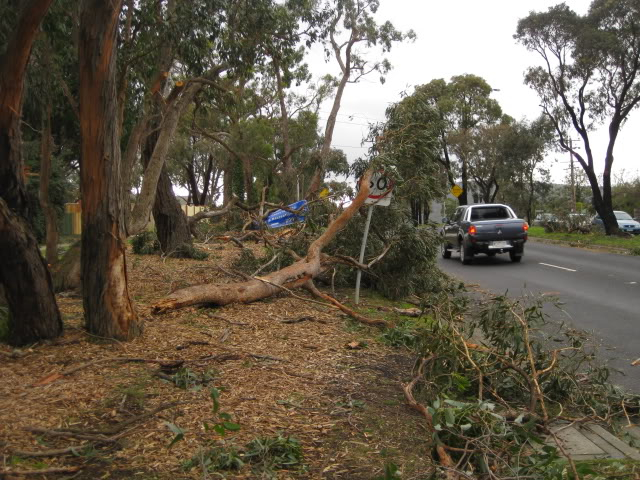 Especially the southern side of Boronia rd east if Scoresby rd and along the northern end of Forest Rd. 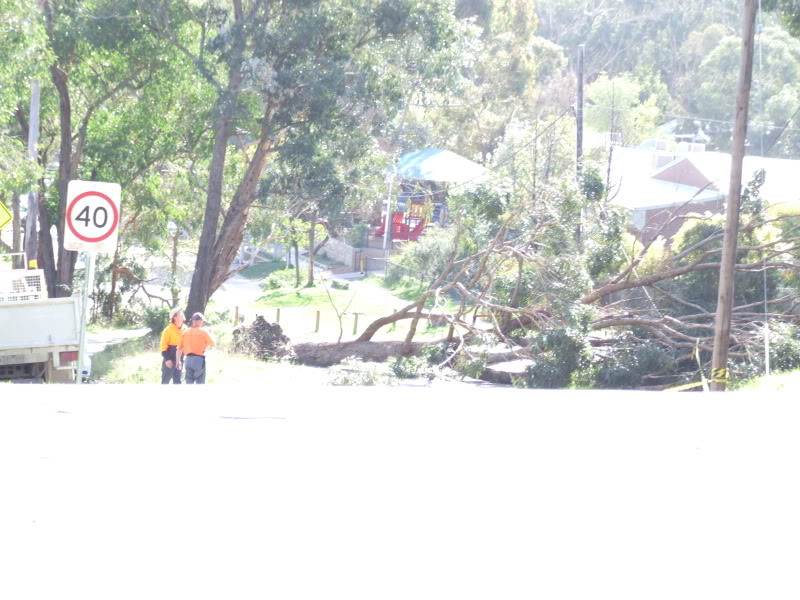 I just got back from Boronia surveying the damage and trying to trace a cause of the damage. My understanding at assessing the damage, it was mostly just before the major rainfall hit with most of the trees snapped either halfway up or uprooted, facing in a SE direction. That to me suggests NW winds rather than the W change. Second the damage region amplifies dramatically as you edge up the hill past the fire station eastbound on Boronia road. Most of the swamp gums along northern side of Boronia road after crossing Scoresby road have had some sort of damage done to them. A little further up there is a reserve with I would estimate 12 large pine trees. These trees are about 30-40m tall and 4 of them have been snapped halfway up. They would be about 80 years old as well and can bend in the wind so the winds would have been in the vicinity of 130-150kmh in the region there. 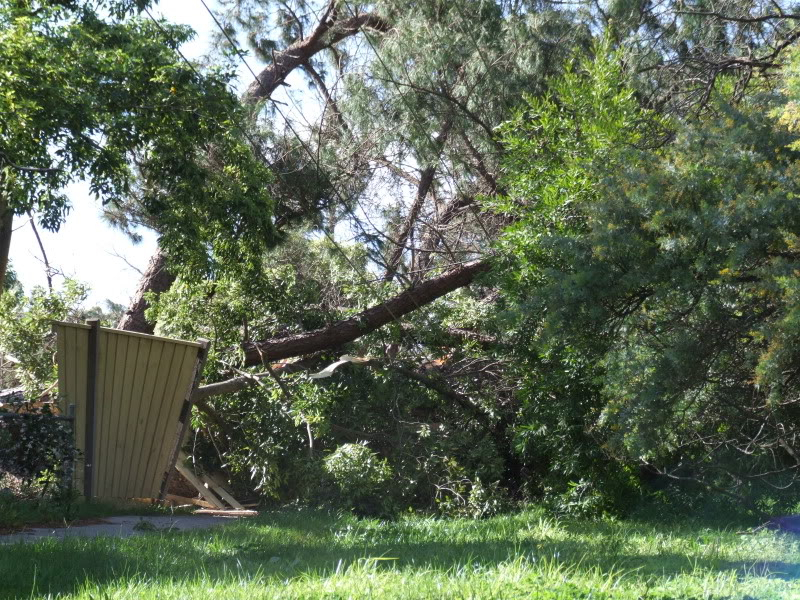 I have surveyed the damage at The Gap in QLD a month after the storm ripped through, there are similarities, but that storm was on a much much larger scale, however the one thing I noticed was the pine trees there were also snapped halfway up as well in a similar fashion. 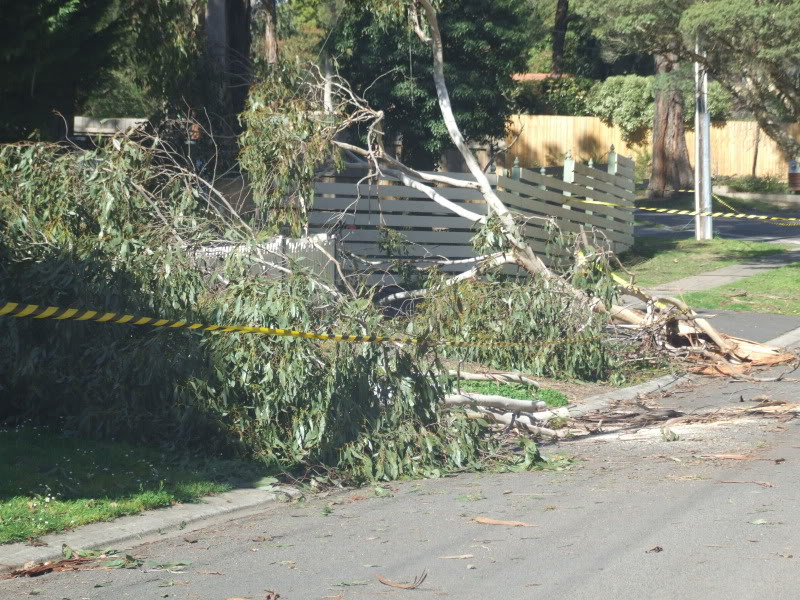 Paton Cres, Valerie St and Narcissus Av are all complete warzones, SES crews still in the street cleaning up and making the buildings that are damaged by falling trees safe. I counted about 2 dozen houses significantly damaged in the Boronia region, however the major cluster is down around the Paton Cres region. Most of the trees, whether big or small have had damage to them. I saw mostly gums snapped or uprooted in this region, and these trees can take a fair gale. This is a windy region and to have whole trees uprooted like that again suggests to me that winds were in the 130-150kmh range. There was no sign of tornadic activity, moreso just very strong straight line winds ahead of a tremendous amount of rainfall. 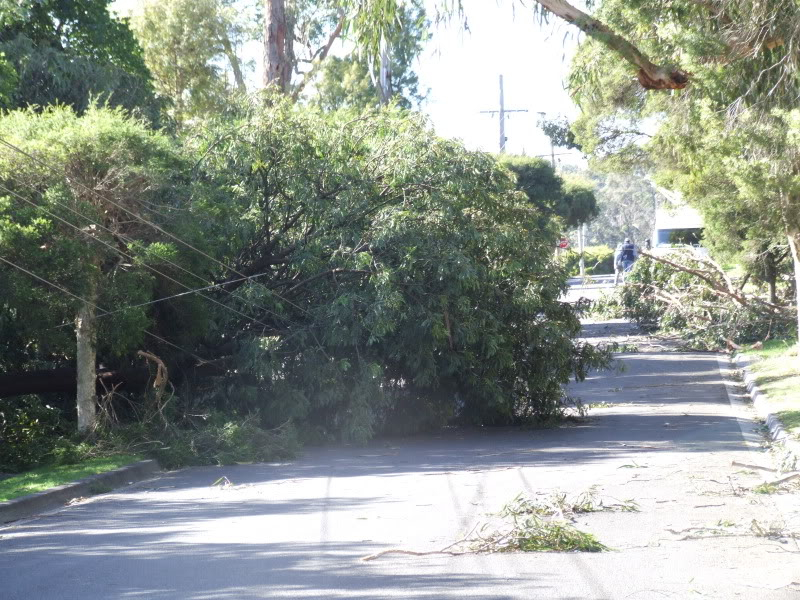 I am just stunned that there were no serious injuries with the amount of houses damaged and people on Boronia road with trees coming down everywhere in these conditions. An amazing site. 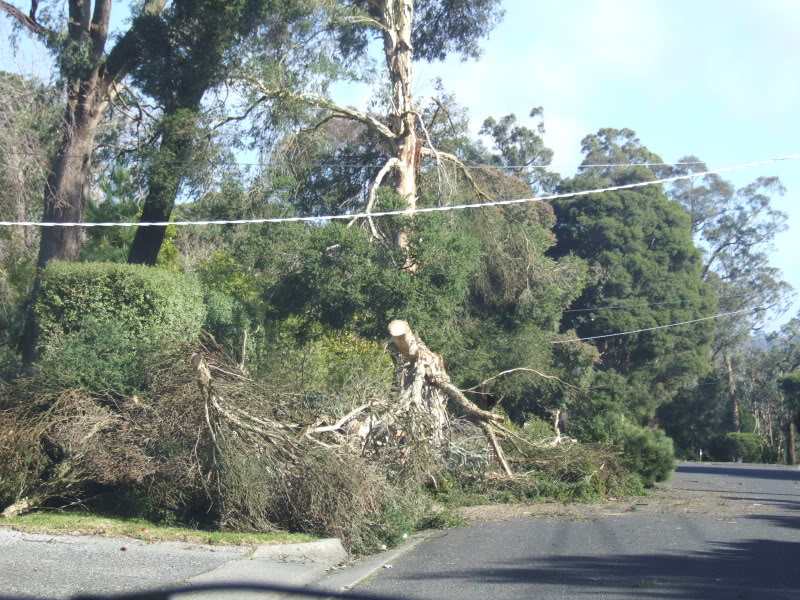 I am going to try and get to Lilydale as well at some stage and Mt Evelyn, but all those regions to the ENE of Boronia exibited tree damage in SES reports. Here locally I was about 2 minutes away probably from being blasted from those conditions, luckily we cut our big trees down!!! Went to Shepparton for work today. A couple of decent pockets of damage around the place. 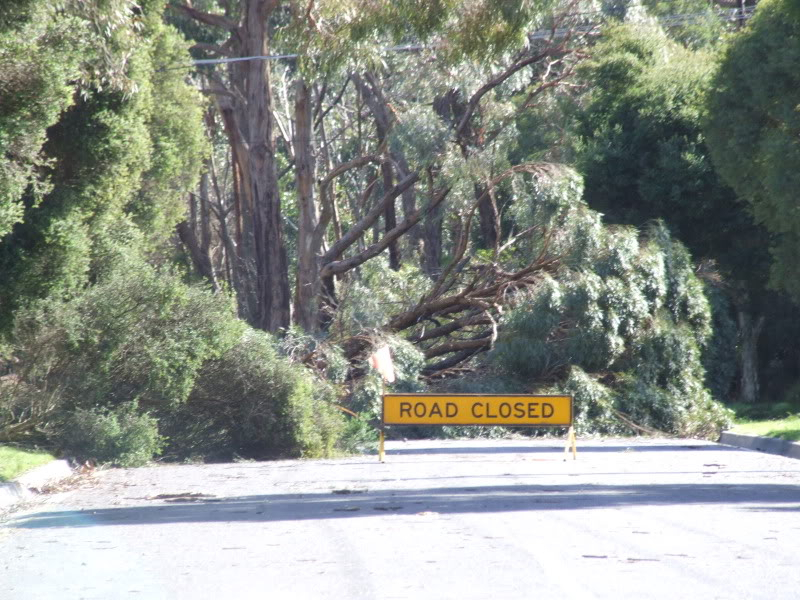 Just north of Rushworth there was evidence of 10 trees down across the road in a 200meter stretch, interestingly laying NE. Another area of interest was just north of Tooleen where once again there was a simular stretch of road and extended into paddocks for around 500meters with trees not only uprooted but large limbs being snapped off the tops. No evidence of twisting though, so once again striaght line winds I believe. Unfourtuantly there were also 2 cars in on the side of the road in Tooleen with smashed front windscreens and bonnets. Would not have liked to have been driving through a treed roadside thats for sure. 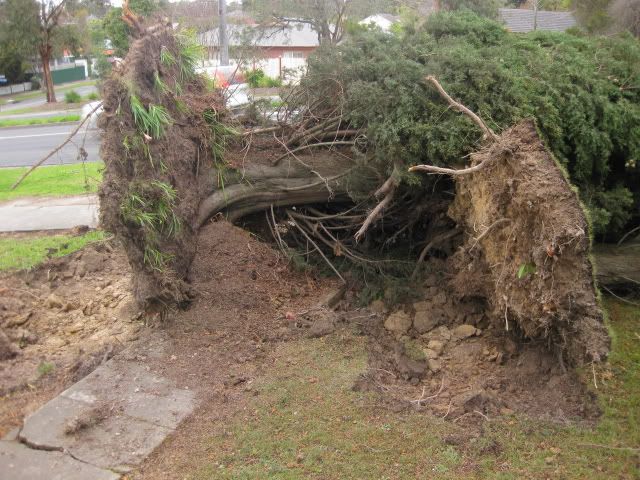 [quote="Karl Lijnders"]I just got back from Boronia surveying the damage and trying to trace a cause of the damage. well we were in rawlings avenue when this storm hit- a stones throw from Narcissus ave, my mother in law mentioned hardly any twiggs around this morning. Council doesn't allow too many big trees to be cut around here. Bit of a fizza up here today after the last few days. A trace of rain, a bit of wind and a temperature that just keeps rising (11.1C when I last checked ). The air mass is just too dry in the low levels for us. PS those with access take a look at EC for late next week - it's gone rather mad with 50mm+ falls on Friday across parts of Vic. A bloke rang the radio last night from Silvan, he is on top of a hill looking west. He saw " a mushroom cloud like ive never seen in my life, it was jet black on top and grey on the bottom, it almost looked like a jellyfish". This was just before 5pm. Now what sort of cell does that sound like and how does the damage relate to it? It is a warmish 12.3c where i am with the costant northerly winds. What he probably saw and at his elevation was probably the front face of the roll cloud moving in, but at this time it was a traditional roll cloud, but more so low level convection from where the hail was falling from. It probably lifted further due to the rise and fall of the land over the region and it riding over the western side of Mt Dandenong. Due west of Silvan is Boronia/Bayswater/Heathmont so that is probably what he was seeing. As the hail shaft passed over here the whole cloud developed further as it hit the foot hills and this causing further lift to the cloud structure. I noticed it when I was outside and CC erupted across the sky with 2 CGs either end of the cloud structure!! It did look very 'Gap' like as it was going to my north and then northeast, but due to wind conditions and sideways hail rain and dirt, it was impossible to get a picture. I will make an interesting side note in this event, as the complex moved over and went to my north, winds went violent westerly, then within two minutes was back to the north and northeast then back to the west northwest in the space of ten minutes so something was definitely going on to my northeast!!! All I can say is the destruction to the tree matter was insane. And this didn't hit a very very bushy area. It certainly is a one in 15 year wind event in the region judging by the maturity of the trees as a whole. 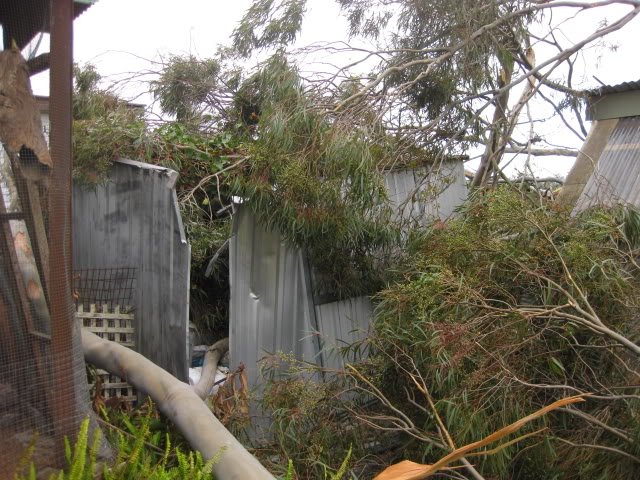 Overall the main damage was to the eucalypt family which is a little more mobile in these conditions and twist and turn in heavy gusts. I was waiting for a 50m tall spotted gum down the road to topple last Friday, Monday and Tuesday but the baby is still there, just depends on the wind conditions!!! By the way the warm air advection is well and truly underway, that WNW wind is now a lot warmer than this morning!!! Could get into 19-20C tomorrow!! !